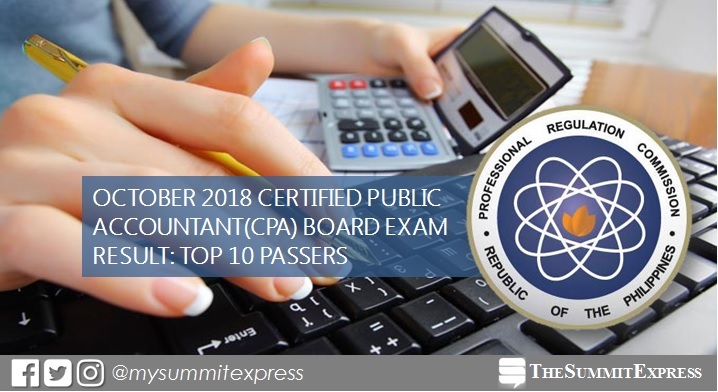 MANILA, Philippines – The full list of topnotchers or top 10 passers in the October 2018 Certified Public Accountant (CPA) board exam is available on this page as officially released on Monday, October 22, 2018 or within six (6) working days after the last day of exam. Lahaira Amy Cayog Reyes of University of Santo Tomas (UST) topped the board with 91.83%. It was followed by Erick Jan Solano Sagot, Ateneo de Davao University alum, with 91.17%. The Professional Regulation Commission (PRC) conducted the CPA licensure exam (CPALE) in the cities of Manila, Baguio, Cagayan de Oro, Cebu, Davao, Iloilo, Legaspi, Lucena, Tacloban and Tuguegarao on October 6,7 and 13, 2018. In the October 2017 CPALE, Alfonso Solomon Ramos Magno from University of Santo Tomas (UST) topped the board with 91.33%. It was followed by Judy Ann Malate Tuzon, University of the East (UE) - Manila alumna with 91.17%. In the October 2016 exams, Vhinson Jay Samson Garcia of Wesleyan University-Philippines Cabanatuan City aced the board with 94.33-percent grade. Southern Luzon State University (SLSU)-Lucban alumnus Daryl John Sarmiento Punzalan ranked second with a rating of 94.17. Monitor this page for the real-time updates on CPA board exam results. Check out also the official website of PRC for more information.